The most professional website designs I have seen. Pros: The support is also very professional. Can't say enough about them. Cons: They are a bag of lies. They promised we could do a bunch of stuff from the get go and all of sudden weren't able to do it after we signed. The salesperson that helped us quit, and then to help us they sent us to YOUTUBE to watch videos on how we could build the site ourselves and figure it out on our own. Pros: They are great and we get lots of reporting from them. Easy to manage and great results. Pros: Happy with inspire. They are always available. Pros: MANY OPTIONS AND EASY TO MANAGE. NEVER A PROBLEM. Cons: Wish they could get approved by Ford. Pros: Great advertising tool. Inspire is our best source for leads. The site is easy to manage. Their reps are the best too. Great site that is easy to manage. Pros: Had for many years. They work hard to keep us happy. Many options. Amazing website. Easy and Effective. Pros: Many good leads and backend never has problems. Pros: It is easy to make changes, get in contact with my rep, and I am overall very glad e are using Dealer Inspire. Pros: This has been a very good experience with us. I am glad we went with Dealer Inspire. Developed in WordPress – DealerInspire zeros in on applications and settings that drive dealer functionality while leveraging the power of a constantly evolving/open-source website platform. Inventory Shortcode Generator – The website manager can quickly create a custom page with inventory in minutes. The Inventory Shortcode Generator allows the user to create a custom inventory feed along with forms, banners, text, and specials. Personalization – Content throughout the site is dynamic based on user behavior. Vehicles and offers change based on browsing history and location via geo-fencing, creating a unique experience for every visitor. True ROI – Website and DMS integration capability determines conclusive lead/sales correlation. Cutting Edge Technology – DealerInspire is constantly exploring new technology to improve the end-user experience and site performance. Most recent advancements: HTTP/2 and enterprise-wide SSL. DealerInspire has been providing websites to automotive dealers since 2013. DealerInspire supports its current installed base of over 700 dealer websites and multiple Tier 2 dealer group sites from its headquarters in Naperville, Illinois. With technology partners like WordPress, Google Analytics, and Dataium, the responsive platform is constantly evolving and easy to use. DealerInspire’s custom scripts and plug-ins, paired with WordPress’s content editor, provide robust system functionality such as: custom inventory pages, multi-step forms, pricing controls, and innovative call-to-action. Behind the scenes, DealerInspire aggregates website analytics, partner analysis, and market data for a detailed view of performance, providing actionable insight. Rich video is central to DealerInspire’s designs. Dealership personalization through video is used instead of Homepage slider images as partner data has shown a sharp decrease in the percentage of people clicking on slides. The comprehensive core offering serves various levels of user involvement from the hands-off/novice to experienced digital marketing managers writing custom scripts and inserting shortcode. Add-ons to the core are available to support online deal structure, robust BDC integration, and provide shoppers accurate/FTC-compliant lease payments. Sister-company, Launch Digital Marketing, provides optional marketing and brand strategy consulting to interested dealerships. Website personalization is a key feature of the DealerInspire product and allows a dealership to differentiate the user experience with up to 30 custom content presentations based on user interaction or the referral site. Beginning with the homepage, a user experiences a presentation that appears uniquely built for them with the message “Building your personal message” appearing as the site loads. This message not only lets the user know something is happening, but Google research has confirmed that by slowing the website down and making it appear to be building the page on the behalf of the user, the results are perceived as more credible (think of major hotel and travel related sites). 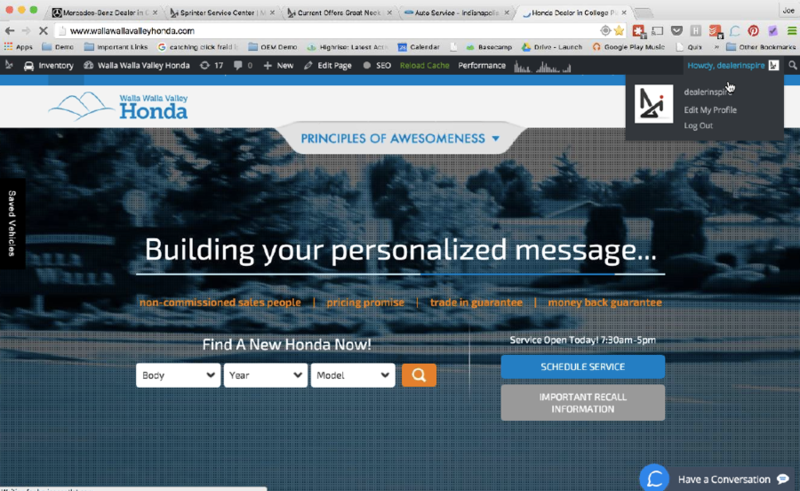 First time user sees “Building your personal message” before the dealer’s tag line “The most likable dealer on the planet!” appears as a welcome message. After searching inventory and navigating back to the homepage, the previous message is replaced with an offer for a vehicle they were just viewing. Personalization extends throughout the entire site allowing service coupons and incentives to dynamically appear based on user interaction. A website manager utilizing the backend tool will first create the rule (example: AutoTrader referral), drag and drop the source, add customize content, and load the message and timing (start and end date). Personalization is tracked in the admin and rules can be saved for future use. DealerInspire has seen as high as 20% better lift in engagement and ultimately lead submission through the use of personalization compared to standard sites. Geo-fencing takes personalization to the next level. The functionality allows the dealership to present personalized offers and messages based on the website user’s location. The platform’s “geo-fencing editor” gives the website manager a Google Map to select areas to market very specific messages. The sophisticated targeting allows the dealership to tailor their messages to shoppers (precision is within feet) at nearby restaurants, competitors, events, and much more. 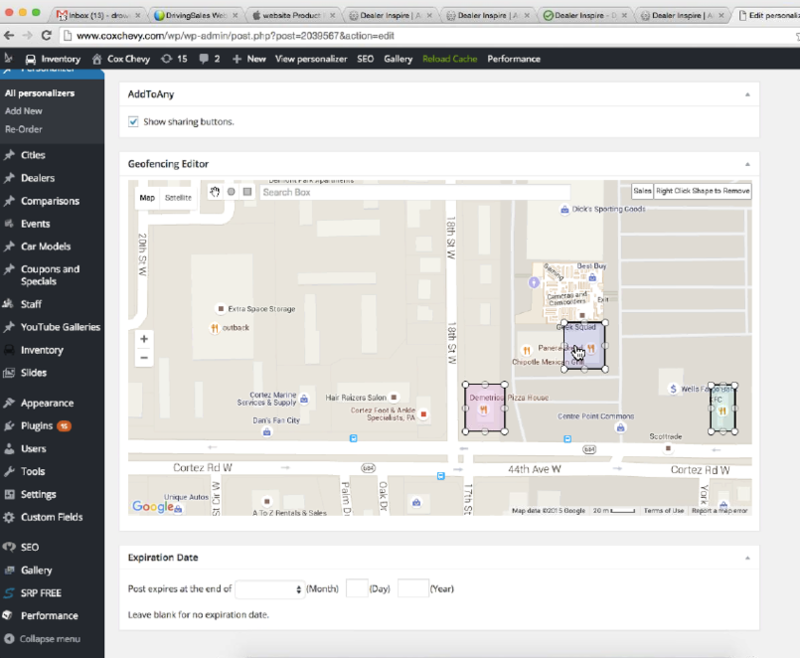 For example, set the geo-fencing parameters around a popular local coffee shop. When someone in that location is searching dealership inventory, display a banner ad for a $25 Gift Card to that coffee shop when the shopper stops in for a test drive. This level of personalization drives user engagement by presenting offers of value to that specific individual. The feature also has the ability to manage timing and expiration date of offers. Personalization/customization is prominently displayed on the SRPs (Search Results Page) and VDPs (Vehicle Display Pages), allowing dealers to choose from multiple techniques utilizing the platform’s built-in functionality. The consumer lead lands on the dealership website from a link on Facebook. The SRP and VDP pages can display specific content designed for Facebook users with messaging and offers unique to this individual type. Smart filters by default will guide the shopper from SRPs to VDPs based upon their previously selected preferences or actions without the need to reenter known variables. Dealers also have robust control of the VDP page display. General options allow the dealer to customize the layout, title tags, and gallery options. Galleries are video-ready and a dealer can even automate the site to pull relevant videos from their YouTube channel. The vehicle save functionality provides the user with the ability to retrieve saved selections across multiple devices. A unique “Ask a Question” feature is a less intrusive form of pop-up lead submission tool that is found to prompt very detailed, high-quality leads from higher funnel shoppers. As the user scrolls down the VDP, a bar appears on the top of the page with the “Ask a Question” call-to-action. Users can submit inquires without feeling like they are engaging in a full transaction. Third party integration allows the dealer to add incentives and rebates, videos, vehicle history, window stickers and brochures. The WordPress platform allows DealerInspire to provide dealership website managers simple yet extensive controls to create custom pages and posts. Full page/post control allows the user to set the template, as well as add media, text, and forms. DealerInspire utilizes a custom plug-in called Inventory Shortcode Generator to quickly design pages with inventory integration in minutes. The tool allows the user to create a custom inventory feed along with forms, banners, text, and specials. WordPress SEO by Yoast is a standard feature that enables robust control and tracking of page-level optimization throughout the site. The integration gives the website manager control directly from the page editor to no-index pages, edit permalink/301 redirect/keywords/social media titles and descriptions, prioritize site map, and gauge SEO effectiveness by keyword. DealerInspire performs rigorous testing on plug-ins to ensure their stability before approving them for use on dealers’ sites. By default, DealerInspire approved plug-ins are installed on the site for the dealership to activate and use depending on the specific requirement. If a dealer is interested in incorporating new functionality, DealerInspire can often suggest a plug-in that is already installed, insert script based on the need, or approve a plug-in developed by the WordPress community. A popular plug-in application is the DealerInspire finance application. This multi-step credit application process has proven to be an above average lead source since any information entered will be transmitted to the dealership after a given inactive period. In other words, an application does not need to be complete to get customer contact info. The application lives outside the site for security purposes. Service Scheduling is integrated with Xtime and other third-party providers in a similar multi-step form that pushes to the scheduler. The platform allows dealers to integrate with popular customer review sites such as Facebook, Yelp and DealerRater. Custom shortcode allows the dealer to pull the reviews onto a central customer review page within the website. Testimonials can also be sourced through the dealer’s site with a simple “Would you like to leave us a review?” application that guides the user to dealership-selected third party review sites. 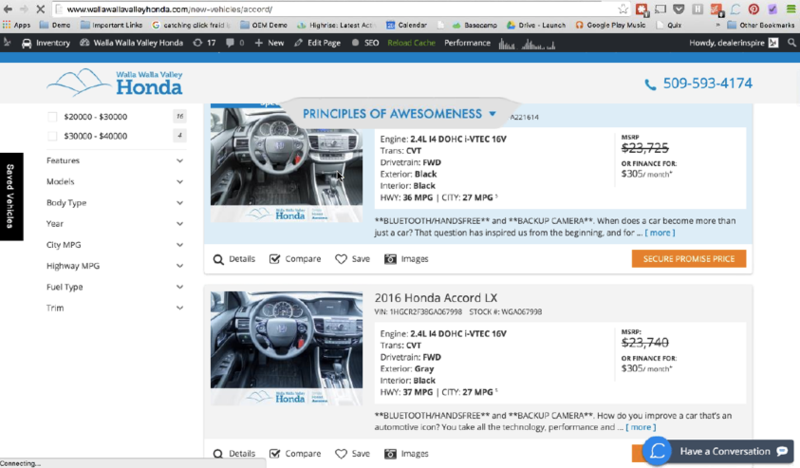 The DealerInspire platform allows the dealership’s website editor to manage options site-wide from the WordPress dashboard. This tool provides the dealership with multiple pricing and inventory display options to tailor the presentation to the user. The “Random Specials” function allows the dealership to set up multiple vehicle specials that will randomly display to the user on each return visit to the site. The system provides custom settings to control frequency, minimum number of displays and pricing allowing the platform to automate the changing display. A timed display feature allows dealers to draw attention to specific vehicles with a call to action that drives urgency. This feature is useful in moving aged or distressed inventory. Dealers can adjust the website price to differ from what is displayed on third-party sites or pulled from DMS data through the inventory feature. This functionality can be locked to ensure that automatic inventory feeds do not overwrite the custom price. This option also allows dealers to set custom web based pricing or stay ahead of any lag in automated rebate or incentive feeds. 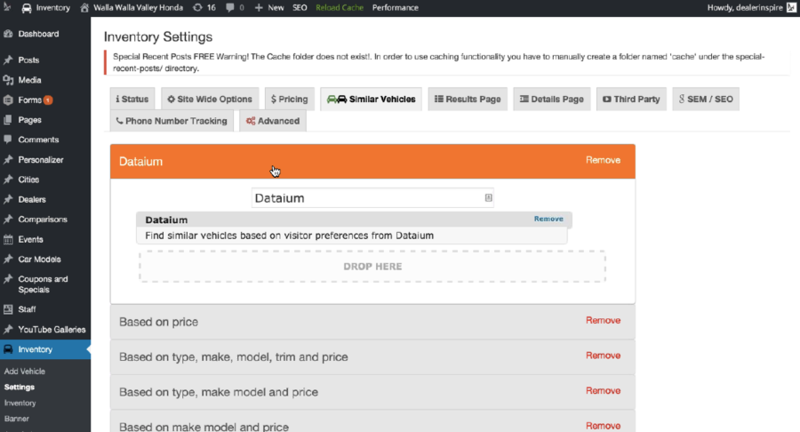 The “Similar Vehicles” option powered by Dataium integrates with the site -wide inventory functionality and allows for price configuration based on market analysis of similarly equipped vehicles (make, model and trim specific). Using market analytics and customer shopping behavior analysis, this tool can help ensure that certain segments of inventory are priced competitively with in the market. Each DealerInspire client is provided access to the analytics dashboard, which provides customized user access based on dealership role. The dashboard collects copious amounts of data from the site, DMS, and third-party tracking systems, and displays the information in simple snapshot views for actionable insight (with deep-dive capabilities). Enterprise analytics is also available for multi-store groups. The “True ROI” feature enables the dealership to quickly analyze what marketing and advertising channels are working best. A pie-chart displays website statistics coupled with DMS data to measure organic, direct, and referral sales and gross. When available, each sale (DMS data) is matched to the customer name and click paths utilized on the Internet to draw conclusive lead and sale correlations. The system also allows for custom tracking of off-line referrals. Lead integration is available with a number of CRMs allowing website and CRM data to be presented in an integrated picture. 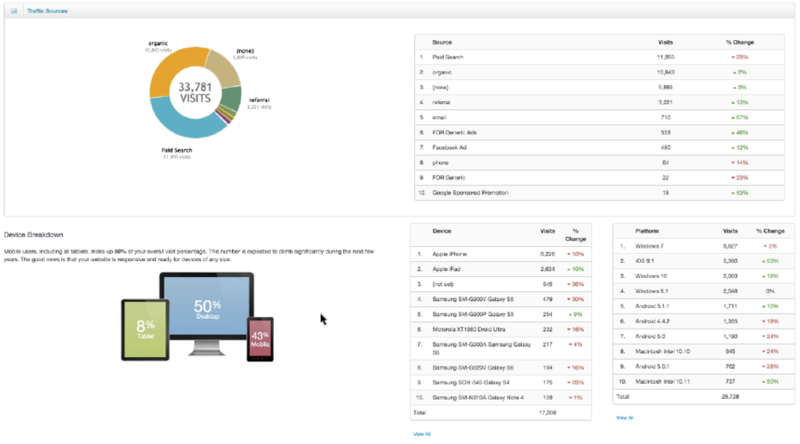 Utilizing the Dataium integration, customer data is enhanced and pushed to the website analytics dashboard for review. Customer search activity is analyzed and tracked, providing insights into social activity/profile links, interests, and “influencer score” (activity on social media) metrics. This data can help assist the BDC/sales associate in communicating with a unique customer. Dataium provides an organic Insights feature that arms the dealer with data about the market and his/her potential shoppers from outside of their own website’s analytics: top makes, top models, price points, and days in market. DealerInspire utilizes Google Analytics as the default for SEM/SEO. From the site-wide dashboard, a website manager can adjust Google Analytics Settings, Google Tag Manager, and Remarketing in Google AdWords. Additional SEO measurement tools, including Website Results Checkup powered by Moz and Organic Keyword data by SEMrush, are available in the dashboard. Links and targeted keyword ranking are also displayed. DealerInspire provides a number of available solutions to better understand how users are interacting with a dealer’s website. The widget designs a customized payment, along with terms and disclaimers. The shopper then has the ability to adjust terms and lock in the payment. The tool also enables SRPs and VDPs to include finance and lease payment data (and links to customize). From the backend, plug-in functionality gives the dealer complete control of payment structure (security deposit, markups, etc.). Conversations support online exchanges with customers via text, online chat, and video chat. The drag and drop functionality gives the dealership representative quick access to inventory, incentives, YouTube videos, brochures & awards, as well as payment calculators. The paid search dynamic advertising tool syncs with the dealer’s inventory feed and create highly targeted text ads based upon availability and various other vehicle elements. DealerInspire offers a collaborative sales tool that connects customers with dealerships to work together online to complete the purchase of their vehicle. The tool features real-time deal collaboration, an integrated credit application, ability to add aftermarket products, and secure electronic signature collection. With fewer documents to sign and much less time at delivery, Online Shopper saves time for the sales team and allows the customer to guide the steps of the purchase. DealerInspire utilizes Amazon Web Services for their secure hosting services, providing them access to the latest cutting edge technology and hardware. The servers are configured in a “High-Availability” setup, which means traffic shifts automatically during outages without DealerInspire intervention. An Auto Scaling feature also enables conditional shut down of certain servers with the flexibility to rapidly scale servers up when necessary. DealerInspire recently made two cutting edge improvements to the system in anticipation of upcoming requirements and for end-user performance. Performance update HTTP/2 - transitions to a single connection from browsers to website; push assets proactively from the server instead of pull (especially important for mobile latency). The typical development timeframe for a DealerInspire website is 6 to 12 weeks. The dealer and Account Manager collaborate on design requirements and dealership data integration requirements. Dealers can provide video and brand specific assets for use in the personalization process. DealerInspire manages a proactive OEM compliance process to ensure any manufacturer required design elements are being met. Launch Digital Marketing (sister company) is available as an add-on service for in-depth campaign strategy, market testing, on-site video, content marketing, and brand development. After go-live, a DealerInspire team member will watch videos and analyze heatmaps from Hotjar over a two week period to fine-tune the site effectiveness for visitors. Support@dealerinspire.com is the primary method to reach the support team, capturing around 80 percent of the total support submitted. Phone and in-system support is also available for users. The average response time is less than one day with about half the tickets closed in the first contact. DealerInspire provides support services designed to ensure dealers of all capacities are comfortable using and maximizing their sites.